This day was beautiful, with sunshine which created good thermalling conditions. I flew with Richard again and we found the thermals strong, wide and right up to cloud base at over 5500 ft. We were up for almost two hours again and first flew over the east ridge but then, I took us over to the west ridge and south to the Lincoln Gap. 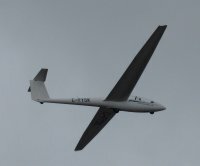 We encountered other gliders in the same thermals and had good close looks at them. The sky would periodically over-develop then open up again. But as the day went on, the over-development stayed around and thermal were harder to find. We went back to the east ridge and after losing a bit of height, decided to end the flight. I flew for a bit more and found a good thermal that took us back to cloud base but had to make tight, steep turns to stay in the best lift. 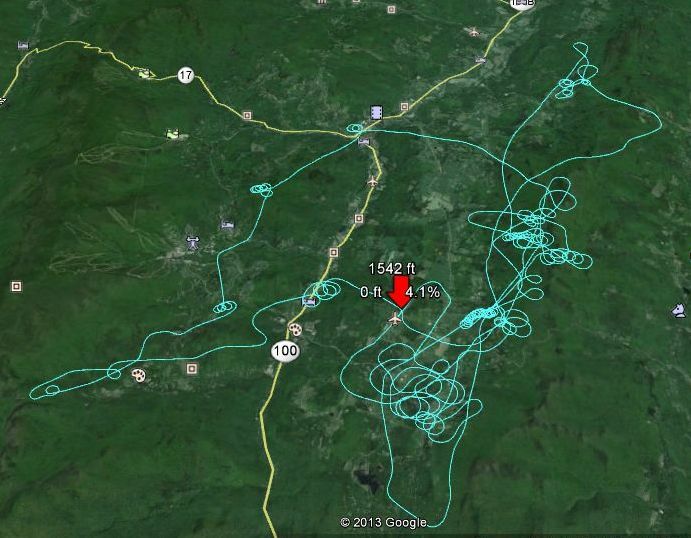 Those circles are evident on the track of our flight due east of the airport. That was the last climb of the flight.